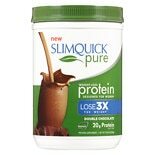 Shop SlimQuick Pure Weight-Loss Protein Powder Chocolate, Double Chocolate (10.58 oz. )10.58 oz. If you're taking care of a loved one or patient, help them get the calories and nutrients they need from concentrated nutrition products. These medical nutrition options can help those fighting cancer, people with swallowing difficulties or other conditions that reduce their appetite or ability to eat properly. Choose concentrated nutrition products with high calories, protein or vitamins and minerals that can help them stay nourished and at a healthy weight. We carry medical nutrition products from brands such as Resource and Novasource. Our selection of concentrated nutrition supplies here at Walgreens.com includes different forms that can meet your needs. There are liquids that are easily mixed into beverages and soft foods without changing their flavor. Some concentrated protein is available in capsules that are taken several times a day. Another option is a flavored beverage that's calorie-dense and full of nutrients for dialysis patients. Additional medical nutrition products are available for a variety of conditions and nutritional requirements. There are pureed foods and thickened juice for people with swallowing difficulties. You can also add thickeners to favorite drinks such as tea or juice. Other foods and shakes can help with getting the proper calorie and protein intake.